Ahoy maties! We're a bit sleep deprived, as we had a bumpy, rainy night last night, but we're now reveling in the early morning cool air on a calm South China Sea. We've just finished our first night on passage back to the southwest, towards Kuching, Borneo. From the little village of Menembok we grabbed seats on a mini-van for the 45 minute trip inland to Beaufort. The road wound among rice fields, patches of forest, and many wooden stilt houses -- a real rural feeling. Beaufort is a charmingly dilapidated town with one central block of concrete buildings rimmed with a wonderful old wooden raised sidewalk that joins the little shops. Beaufort's claim to fame is that it is on the railway line, built in 1905, and that's what brought us here. We crashed for the night in the one hotel, up 4 flights of tattered carpeted stairs. The rooms had great views over the shops, to the lush green hills and the city mosque. The "imam" of Beaufort had the most melodious call to prayer we've heard in months. It was almost nice to be awakened at 5am. At 7:30 the next morning we bought our 75 cent tickets and boarded the little diesel engine drawn train, burdened with extra water bottles and snacks in case the train was held up by mud-slides or downed trees, a common occurrence! It had just 3 small wooden carriages with sliding windows and vinyl-padded seats which had seen better days. We were the only tourists. 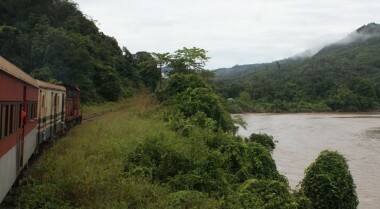 The train is mainly for the local people who live along the Padas River. We were kindly told to take seats on the right side for the best river views, so we settled in and watched the swirl of Borneo humanity clamber off and on. School children, toddlers, babes in arms, old men with big grins and wrinkled faces, old women with narrow faces and high cheek bones (non-Malays), and the round faced Malay-Muslims, the women in their bright garb and "tudong" head scarves. For much of the 3 hour ride we stood at the open doorways of the carriages to get better views, holding onto the vertical railing as the train jolted and lurched up the canyon. Stops were announced by a sudden slowing, then a grinding, screeching halt. Sometimes there was a small platform but often it stopped at just a random house in the jungle by the river where people waited to board. Beside the tracks, the chocolate-brown Padas river flowed through forests with immense trees, stands of bamboo, and a few palm-oil plantations to the south. As we traveled higher, it changed from a wide meandering flow to a narrow tumbling mass of rapids. Tenom, some 50 miles (80 km) up the river, is the end of the passenger service, so we got off and sought lunch in the bustling little village. Shade, fans, and fresh lime juice were our 3 goals. 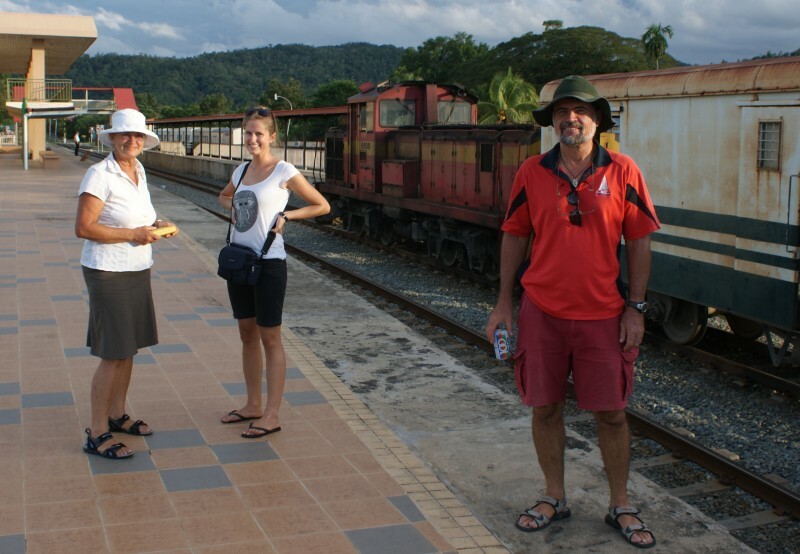 Our meals were typical Borneo fare -- rice or noodles with curries of beef, chicken or veggies. From Tenom we rode in air conditioned luxury on an Express bus all the way to the capitol of Kota Kinabalu (KK). The journey followed a new highway over the southern crest of the Crocker Range, a protected forest/mountain range which is home to Mt Kinabalu, Borneo's highest peak at 13,500' or 4100m. Unfortunately, Malay busses like to entertain their passengers with B rated movies, often horror films. The one that played was in English, with no subtitles, and it was so gross Jon asked to have it turned off. The attendant didn't understand so we let it play another 3 minutes until the next horrific scene, then Jon flipped off the power to the screen. Not one protest from anyone. After that, we enjoyed the view a lot more! 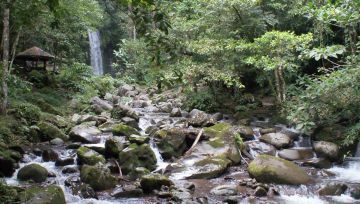 A lovely waterfall, deep in the Borneo rainforest. 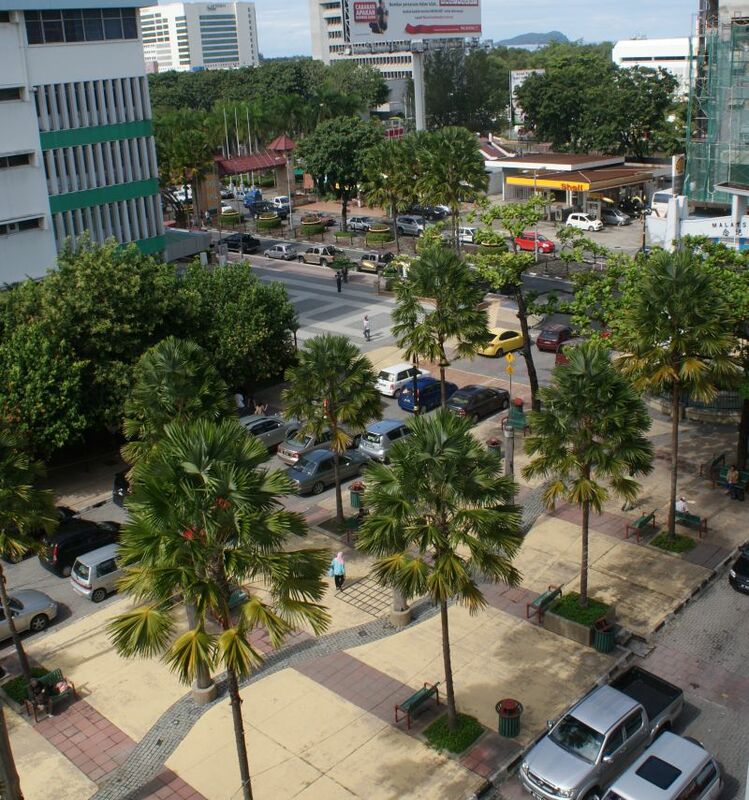 Kota Kinabalu (fondly known as KK) is the largest city in Malaysian Borneo, with many malls, wide streets, the ocean to the north and green hills to the south. We showered off the day's road/track dust, did a bit of shopping, then met again at 6pm in our hotel room for a sundowner of sweet local Arrack Balantee, a rich dark rum from Sarawak, Borneo. (No, not everyone here is a Muslim!) We found an air conditioned Chinese restaurant where we indulged in local prawns in curry and garlic. YUM! Carmel and Rachel had to return to Labuan the next day so we took off on our own in a rental car ($35/day, unlimited miles). We headed south again, to re-cross the Crocker Range on a different road, twisting and turning up the the jungle roads, stopping for photos. Our destination was the Rafflasia Information Center in the park, which had interesting info, but the one flower in bloom was the same species as the one we'd seen near Kuching last month so we declined to pay their ridiculous $30 fee to be guided to it. Instead we drove north and found a beautiful forest trail to a waterfall with cascading drops, clear rocky pools and lots of butterflies. We stopped for the night in Ranau, infamous as the end-point of the terrible WWII Death March on which thousands of British and Australian soldiers died. Only 6 Aussies escaped, and it was from them that the world learned of the terrible ordeal. 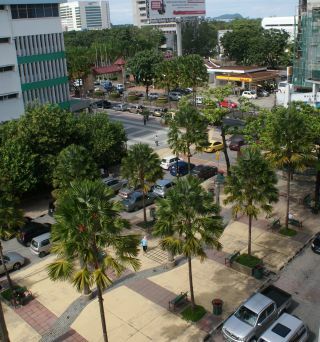 Sandakan, which we visited with Suzette and Sandy last month, was the start point, and the beautiful monument there is maintained by Australia. Strangely, the end point in Ranau also has a memorial but it's maintained by Malaysia and there is a fee to enter. It seemed strange to be asked to pay admission to visit a war memorial. The next morning we drove to one of three national park entrances for Mt Kinabalu. Poring Hot Springs is the lowest in elevation and is home to natural springs, first gentrified by the Japanese using POW labor during WWII. We declined to jump in - It was hot enough in the air! But the Malays poured in by the hundreds, coming with picnic baskets, kids, old people, all to soak in the dozens of lined pools. We saw no bathing suits - Everyone entered fully dressed in their clothes! 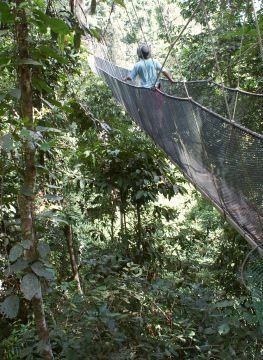 While the Malays were soaking, we climbed the forest trail to a wonderfully wobbly aerial sky-walk that looked out over the jungle. Bird-song filled the air, and insects buzzed and chirped all around us. 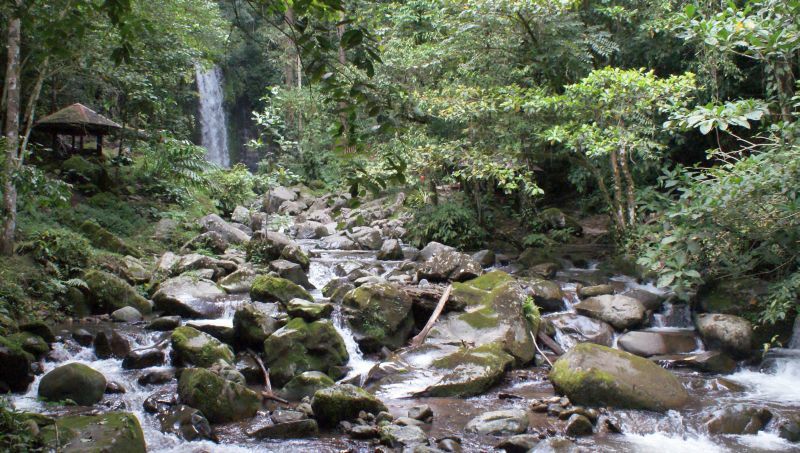 We traipsed out to a small waterfall and visited the butterfly garden where Brooks' Raja Bird‑wings, magnificent red-headed black butterflies with brilliant blue-green wings, sipped the nectar of bright flowers. On the road near the park entrance we found little cafes and hostels, where the "poor folk" stay. All of Kinabalu park's food and lodging is run by Sutera Sanctuary Lodges, and accommodation is over $150/night/person, even for Malaysians. Not surprisingly, the hotel cottages and restaurant were pretty empty! Some enterprising families along the road to the park have created jungle/garden plots where they grow liana vines and Rafflesia. When they have a blooming flower they put out a huge banner by the road. We stopped at one and were treated to a Rafflesia keithei, the largest flower in the world -- though this one was "only" 2.5 ft (75 cm) across! Big, red with white spots, awesome flower. 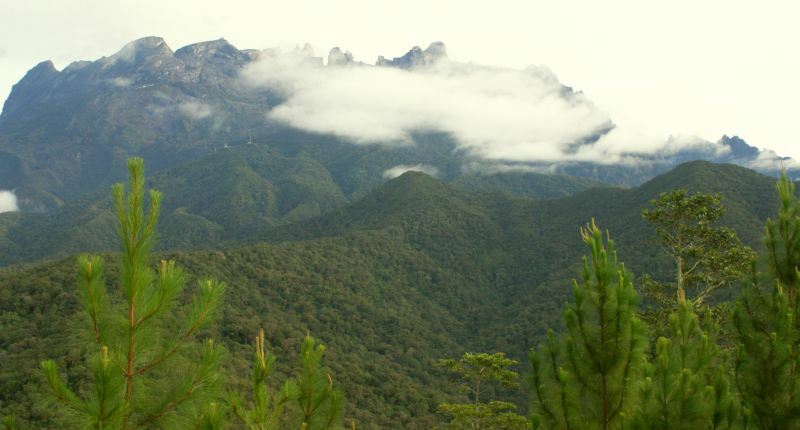 Skirting the base of Mt Kinabalu, we entered the park at the "standard" entrance, where miles of trails criss-cross the forest. We hiked for an hour before the afternoon rain settled in -- a typical downpour. They get more than 1/2" (1 cm) of rain every day! Our main animal find was a big chameleon on a tree - very spiky and sci-fi looking. We spent the night outside the park at the popular and affordable Kinabalu Rose Cabin. There we met a Malay-Indian family who shared their Diwali holiday treats with us. They were fascinated by our lifestyle on the boat. The husband and a young friend were climbing the mountain and came hobbling back that evening. Climbing Kinabalu is a 2‑day event, much like climbing Rainier. You hike up over 4,000' (1300m) the first day, hopefully arriving at the mountain hostel before the rain gets you. Then you get up at 2am and head for the summit in the dark, up slippery granite with fixed ropes for hand-holds. If you're lucky you get a sunrise over Borneo from the top before the clouds close in. Then you trek down, down, down 6000' (2000m) to the park entrance. We had been game to try it, but the greedy Sutera Resort company controls the hostel fees for that night on the mountain: over $100 for the night, in a dorm bed. No camping or self-catering (which used to be allowed). Add the park's obligatory guide fee, insurance fees, and park entrance fees and it all gets to be a bit much. There is no discount for Malays either. So we did the next best thing, which was to photograph the peak from our bedroom balcony at Rose Cottages in the early morning! Then we drove a long and winding road to the highest entrance of the park at Mesilau Nature resort, where we enjoyed hiking a grueling, yellow-muddy, forest-shaded, fabulous 5 hours on the mid-slopes of Kinabalu. We passed blooming rhododendrons, wild begonias, orchids, carnivorous pitcher plants and countless small flowers along the trail. At a shelter where we stopped for water and snacks we were entertained by native tree shrews and Prevost's squirrels -- both about the size of north American chipmunks and just about as cheeky! 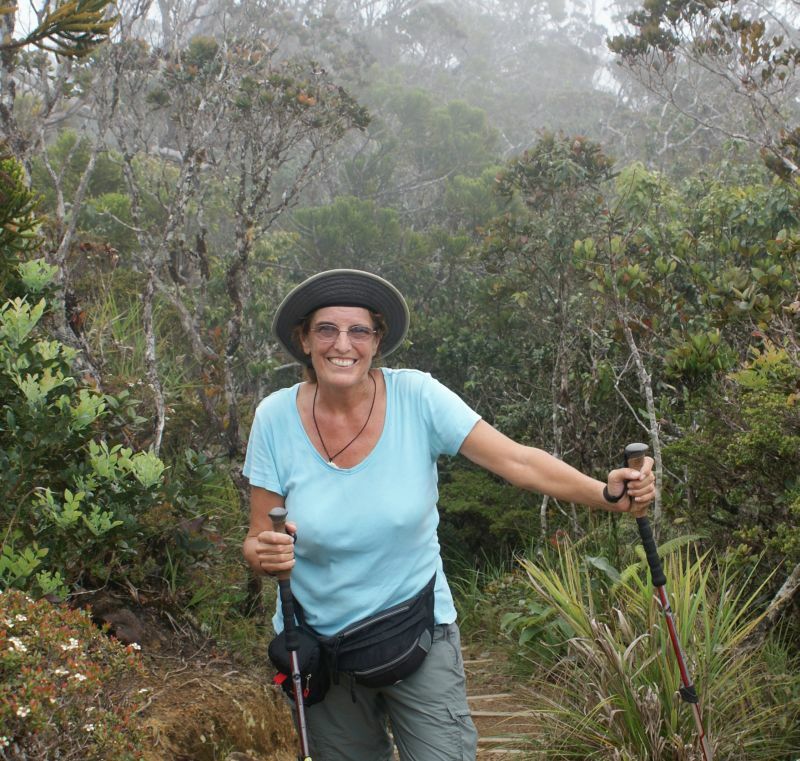 Sue took her Himalayan walking sticks and was really glad for the added stability on the steep natural steps, slippery rocks and flower-strewn trail. We hiked over 1000' (300m) up, then 1000' down to the river before turning around and retracing our route back to the car. A great day on the mountain!! We treated ourselves to cups of hot Sabah Tea at a tea plantation high in the hills, then battled Saturday night traffic in torrential rain back to KK for the night. The next day we ferried back to Labuan and Ocelot. Rachel had opened up the boat for us, so it wasn't a sweat-box when we arrived. We enjoyed 2 more days at the marina, Jon playing with his new boat "toys" that had arrived while we traveled. Sue had more details to sort out on her Take a Walk book, so we were glad of the air conditioned lounge at the marina and the good internet!